Director – Michael Schultz, Screenplay – Steven E. de Souza, Based on the Comic Book by Will Eisner, Producer – Paul Aratow, Photography – Frank Thachery, Music – Barry Goldberg, Special Effects – Al Lorimer, Production Design – Fred Harpman. Production Company – von Zerneck-Samuels Productions, Inc./Warner Brothers. Denny Colt, a detective in East Amphett, Oregon, arrives to visit his good friend William Sevrin, only to find he has been murdered. Before he dies, Sevrin gives Denny the title page of the book he was writing about crimes being conducted at the Roxton Museum in Central City. Denny heads to Central City, intending to interview museum head Simon Teasdale but is thrown out. One of Teasdale’s associates offers information and asks to meet Denny at the docks later, only to shoot him. A funeral is held but afterwards Denny claws his way up out of the grave. 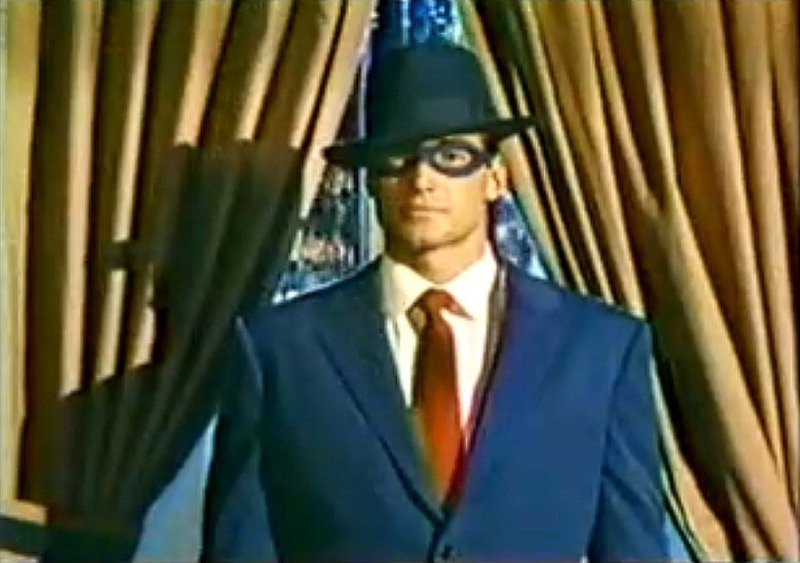 Setting up base in a crypt in the Wildwood Cemetery, Denny, with the aid of the young street kid Eubie, adopts a blue suit, hat and mask and sets out to fight crime, calling himself The Spirit. The legend of The Spirit grows around town and crime goes down. Denny reveals his true identity to Commissioner Dolan, although keeps it hidden from Dolan’s daughter Ellen. He and Ellen are drawn to one another in the course of his investigation into the forgeries being created at the Roxton Museum. The Spirit was a comic-book character from the legendary Will Eisner (1917-2005) who was also responsible for creating other famous comic-books like Blackhawk and Sheena, Queen of the Jungle – see Sheena (1984). The Spirit is Eisner’s most famous work. It was produced as a sixteen-page colour insert in several newspaper Sunday supplements,. This ran from 1940 until 1952, all written and drawn by Will Eisner except for a brief stint where he served in World War II. The strip centred around the masked title character and his various battles against crime. It has become widely regarded as a classic for Eisner’s artistic innovations. Indeed, the Comic Industry has named their annual award after Eisner. The Spirit was one of a spate of comic-book adaptations made for tv during the 1970s-80s. This could be called the MCU/DCEU Phase One if you like and saw tv series such as The Amazing Spiderman (1977-9) and The Incredible Hulk (1977-81); several would-be tv pilots for series that never got off the ground for Dr. Strange (1978), Captain America (1979), Captain America II (1979), Nick Fury, Agent of Shield (1998); and the odd cinematic film such as Captain America (1990), The Punisher (1990) and the notorious unreleased The Fantastic Four (1994). From the DC side, we had tv series such as Shazam (1974-5), Wonder Woman (1975-9), The Flash (1990-1) and much more successful big-screen incarnations of Superman (1978) and Batman (1989). Aside from the latter two, most of these were either not very good or so compromised the comic-book exploits – a lack of super-villains, the superheroes engaged in no more than regular cop show crime-fighting plots rather than any world-threatening battles – that they were a pale shadow of their counterparts on the comic-book page. This version of The Spirit gets a fairly bad rap but I found it far better than I was expecting to be. It makes an earnest effort to get the feel of Eisner’s original comic-book. De Souza introduces several of the comic’s regular characters – Ellen Dolan, her father the commissioner, P’Gell. You could even argue that Bumper Robinson’s Eubie is an attempt to create a more acceptable version of the controversial racist caricature of The Spirit’s sidekick Ebony White. There’s a Wildwood Cemetery where The Spirit lives. 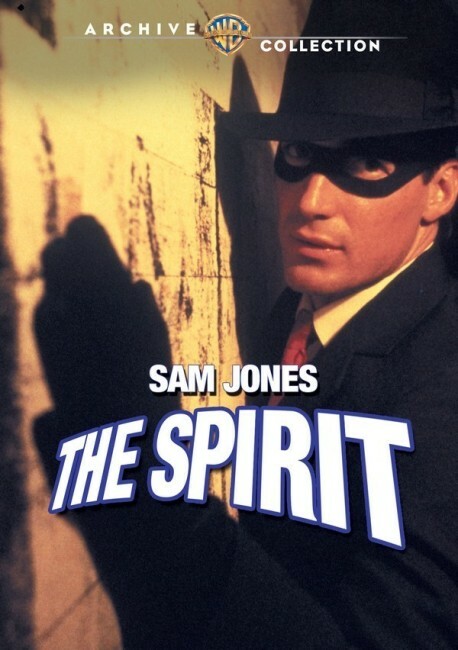 Sam Jones’s costume has been designed to look exactly like Eisner’s drawings – which is probably an ill-advised move that comes out looking rather silly with him outfitted in a blue-purple suit, fedora and domino mask. Steve E. de Souza’s script is decidedly tongue-in-cheek – P’Gell comes out with lines like “You’re a lousy liar, Spirit. Your kiss betrays you” – and Michael Schulz directorially attempts to get the zany comic-book feel that Eisner gave the strips – like the scenes running around the museum with Sam Jones trying to shove Nana Visitor out a bathroom window or the fight scenes with the thugs – even if this is a film that is far too budgetarily earthbound to ever soar with the zaniness that Eisner gave the strip. Subsequent to this, The Spirit was incarnated on the big screen with the Frank Miller directed The Spirit (2008), a film with a bad movie reputation that is so gloriously madcap that it should be resurrected as a cult film.